Photo 1: Newly developed pit at Kansanshi mine, 2018. Robby Kapesa is a PhD student at the Copperbelt University under the Dag Hammarskjöld Institute for Peace and Conflict Studies in Zambia. 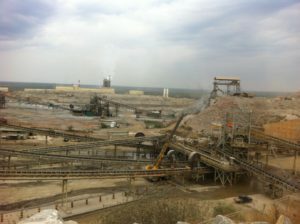 Following the privatization of Zambia’s copper mines that was begun in 1997 and successfully completed in 2000, the industry obtained the large foreign capital investment necessary to revitalize some existing mines and open up new mining frontiers in the country, such as Solwezi in North-Western Province. Many Zambians anticipated that this new foreign capital would spur the country’s economic growth and therefore create more jobs on the mines. 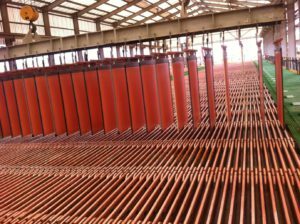 In 2016, Zambia produced about 770,000 metric tons of copper, of which 490,000 metric tons – 64 % – came from the Solwezi mines. With this growing importance of high copper productivity relative to the ‘Old Copperbelt’, the local population hoped that the mining boom would improve their livelihoods and transform Solwezi (and North-Western province in general) into Zambia’s ‘New Copperbelt.’ It was widely believed that the area would witness an improving level and quality of infrastructure (e.g. roads, water and sanitation and health and education facilities), corporate social responsibility projects, and employment and business opportunities associated with the ‘Old Copperbelt’ if not better. It was also hoped that the ‘New Copperbelt’ could avoid the social and economic problems associated with the ‘Old Copperbelt’ such as labour unrest and the difficulties of dependency on minerals whose fluctuating price was decided by global markets outside Zambian control. To ensure the realization of these hopes, the traditional chiefs in Solwezi allocated a massive amount of land for mining and related activities. This contrasted to the experience of the local population of the ‘Old Copperbelt’, which was in the colonial period evicted or excluded from land that was exclusively allocated to mine companies; during this process, legitimate chiefs, such as Senior Chief Chamunda Mushili II of the Lamba, were deposed by the colonial government for being uncooperative with government and mining companies. Following independence, the Senior Lamba Chief, now Mushili IV, was temporarily suspended by the new Zambian government following his repeated allegations of the economic neglect of his people. Photo 3: Kansanshi mine plant in operation, 2018. In contemporary Solwezi however, during the initial stages of mining development, it was the chiefs, as the customary holders of land rights, who awarded and/or sold huge tracts of land to prospecting mining companies in order to attract more foreign capital to their area. The underlying logic here is intuitive; more investment should mean more jobs and other mining-induced economic benefits and opportunities for the local population. The expectation that Solwezi would soon be Zambia’s ‘New Copperbelt’ led the local population to embrace foreign capital, even at the expense of their existing livelihood strategies such as agriculture. The major questions which then arise are: Does the massive investment in mining in Solwezi benefit the local population? Has the sacrifice of alternative economic activities and the support given to mining investment yielded the heralded benefits? Today, with all the three Solwezi mines in their production phase, it seems unlikely that mining is improving livelihoods in the way that the local population expected. Thus, the idea that Solwezi could avoid the political and social problems that have continued to burden the ‘Old Copperbelt’ has begun to wither in the minds of many residents. When addressing the National Assembly in October 2016, the opposition Member of Parliament (MP) for Kalumbila (Solwezi West Constituency), Mr Teddy J. Kasonso, complained: “Despite Kansanshi, Kalumbila and Lumwana in Solwezi paying huge amounts in tax to government, there is no meaningful development in my constituency and North-Western Province as a whole.” His comment resonated with the popular local perception that mining has failed to improve livelihoods in North-Western province. 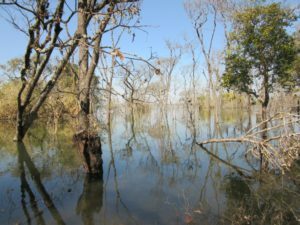 Photo 4: Kisola dam overflowing into Kalumbila forest, 2018. In addition, mining has impacted negatively on the natural environment. Photo 4 shows the Kisola Dam in Kalumbila, constructed by Kalumbila mine in 2015. The Dam blocked the Kisola stream, which overflowed into the Kalumbila forest, destroying flora and fauna in its way. As of today, the dam has severely contaminated the stream, the main source of drinking water for the local population. 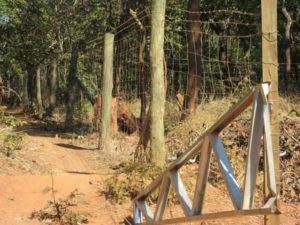 Even more striking, all the Solwezi mines, like their ‘Old Copperbelt’ counterparts, have fenced off their concessions, including those areas that are not currently in use, in order to prevent the local population from trespassing. This has curtailed their access to vital local environmental products and services such as medicinal plants, wild vegetables and fruits, and mushroom, upon which their livelihoods and health depend. Photo 5: Kalumbila mining concession wire fence, 2018. 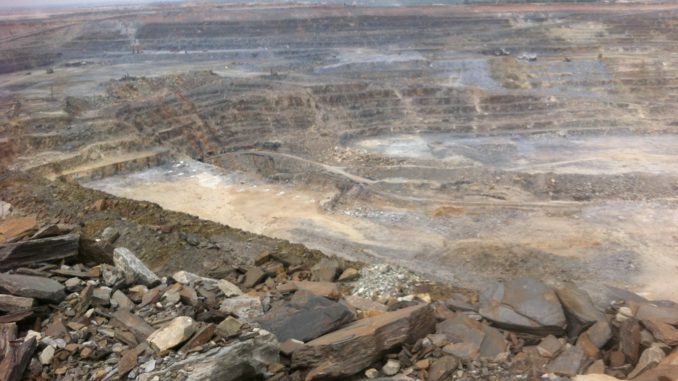 The Solwezi mines, again like their ‘Old Copperbelt’ counterparts, have not created enough job opportunities to meet local demands and expectations. The Zambian mining industry employed c. 27,000 directly employed workers in late 2016, of which the Solwezi mines employed less than 6,500: in contrast, during the ZCCM era of the 1960s and 1970s, Zambia’s mines employed up to 70,000 directly employed workers. In fact, the need for skilled workers meant that most of this number were not locals but former mineworkers from the ‘Old Copperbelt’. Thus the new mines are promoting migration and increasing the potential for ethnic competition and tension in the area between existing residents and these newcomers. Thus, despite the Solwezi mines investing more (52% of the US$13 billion total mining sector investment between 2000 and 2015) than their ‘Old Copperbelt’ counterparts (48%), the former have created far fewer employment opportunities than the latter. As a result, a large portion of the employable local population has remained jobless despite losing their land to the mines. 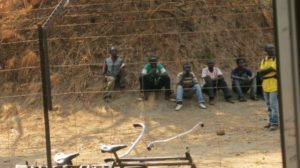 Photo 6: Some of unskilled job-seekers at Kalumbila mine outside the fence, 2017. 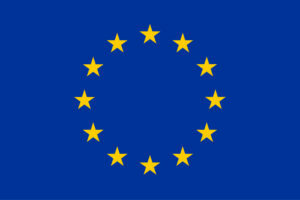 Thus far, therefore, the expectation that mining would improve rural livelihoods and transform Solwezi into the Zambia’s ‘New Copperbelt’, in terms of infrastructure development, employment creation and corporate social responsibility, as witnessed in the Old Copperbelt during the ZCCM era, remains unfulfilled. The resulting frustration of the expectant local population has provoked collective grievances, which in turn facilitate ethnic mobilization. Notably, the local population sees their compatriots from other parts of the country as the major beneficiaries of the mining-induced economic benefits and opportunities, and the violent protest by the local population in Kalumbila in March 2015 is the case in point. During this protest, migrants to Kalumbila (Zambians from other parts of the country) were the target of violent attacks, and the local population demanded that Kalumbila mine reserve its unskilled and semi-skilled jobs for the local population. The tendency by locals to see other Zambians as the main beneficiaries of the area’s mineral wealth has shifted local attention and animosity away from the mining companies that do not produce enough benefits and opportunities to meet local expectations to their compatriots, in turn creating ethnic division and tension. Thus, although mining has the potential to positively transform environments, communities and economies, in Zambia for almost a century, in both the ‘Old’ and ‘New’ Copperbelts, this potential has remained unfulfilled. And in Solwezi the failure of the current mining boom to improve rural livelihoods, has provoked fierce competition for the limited mining-induced economic benefits and opportunities available, which predisposes the area to heightened ethnic conflict.